For many, swimming with good underwater headphones and a submersible mp3 player does make a lot of difference. Listening to a good underwater theme not only helps us train with that extra shot of motivation we need but also makes the lengths shorter. To make things easy, we have prepared a comparison with the best underwater headphones and MP3 players of the moment. According to a study published in the Science Direct journal, the music can improve up to three seconds the marks of the swimmers in the 200 meters swim. And for professional swimmers, that can mean the difference between winning an Olympics or losing a podium. But not only that. For music lovers like us, underwater headphones and submersible MP3s are like sunglasses for the summer. They help you get the most out of a good dip and other water sports without worrying about breaking them: can you imagine surfing a wave listening to a good Reggae song ?, or rafting in the Pyrenees with a song by Los Ramones? How to choose the Best Underwater Headphones? In our comparison of the best underwater headphones and submersible MP3 players, we will show you the pros and cons of each of the devices we have selected. For years the brands are betting heavily on this segment and with each new version, the underwater headphones and mp3 players include new improvements: analysis of heart rate, calorie burn, performance, routines … In our list we detail everything and in the next section, you will see what you can get from the cheapest underwater headphones to the most sophisticated submersible mp3 players. You can also find a small guide that we have made: tips to choose those waterproof headphones that suit you. 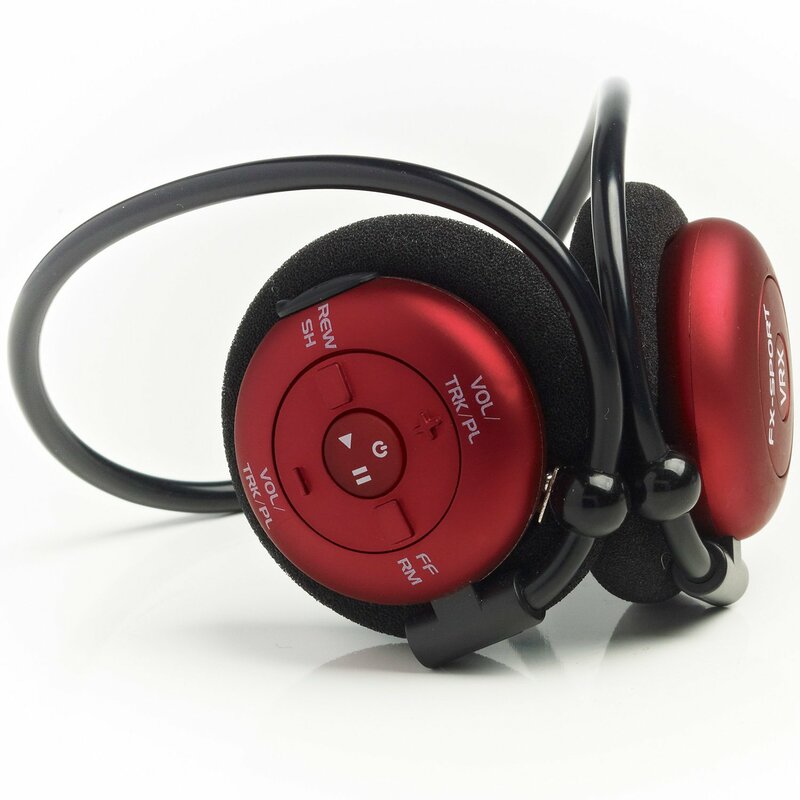 Guide to choose the best underwater Mp3 players and headphones for swimming. Design: You have to like it, be tough and hold yourself well. Nor should it allow the passage of water to the ear canal if it is of the In-Ear type. If it’s over-the-ear, you’ll want as much comfort as possible. Battery: It is important that the water headphones you choose have good batteries. Think that you will use it outdoors and sometimes it will be difficult to recharge them. Comfort: Must allow freedom of movement and fit well with the ear. Also, easiness to use should be taken into consideration. Water resistance capability: Comes in the international IPX standard that carries the technical specifications of an underwater device. It varies on a scale of 0 to 9. A higher numbering, greater resistance to water. Compatibility: the MP3 player or underwater headphones that we choose should be able to play as many audio formats as possible. If it has Bluetooth connections it must be compatible with the main standards to match it without problems. Sound Quality: We will want our waterproof MP3 players or submersible helmets to reproduce the sound as faithfully as possible. Without Bluetooth connection, it does not have the capacity to measure physical physical variables. The first iPod Shuffle was presented by Apple at the Macworld show in January 2005. Initially, it had an initial storage capacity of 512Mb and 1GB, it was not submersible and unlike the other iPods, it had no screen. Much has changed since then and now the iPod Shuffle is a submersible MP3 and can be purchased with a capacity of 2GB, equivalent to the storage of about 500 songs in high quality. The iPod Shuffle retains the original design of the first device. But inside it has changed a lot: now it is an underwater mp3 player and it has a bigger storage capacity in the same size. You have them in 6 colors: gray, gold, silver, pink, blue and red. It is made of anodized aluminum. If you have seen it, you will know that this underwater MP3 player is quite light. It weighs only 12.5 grams and has minimum dimensions (9 x 31.6 x 8.7 mm). It is perfect for swimming and performing any water sport. In the center, it has a circular control panel, which is the main control. It is quite easy to use and Apple has not complicated anything: with the circular control panel the music is played or paused, next or previous and volume control. In the upper part of the device, there is a 3.5 mm connector, a small 3 position switch for power on, trigger shuffle. Additionally, it has a button for the ” Voice Over ” function that allows you to listen to the name of the playlist, the song or the artist. This comes in 29 languages among which are Spanish, German, Chinese and French. 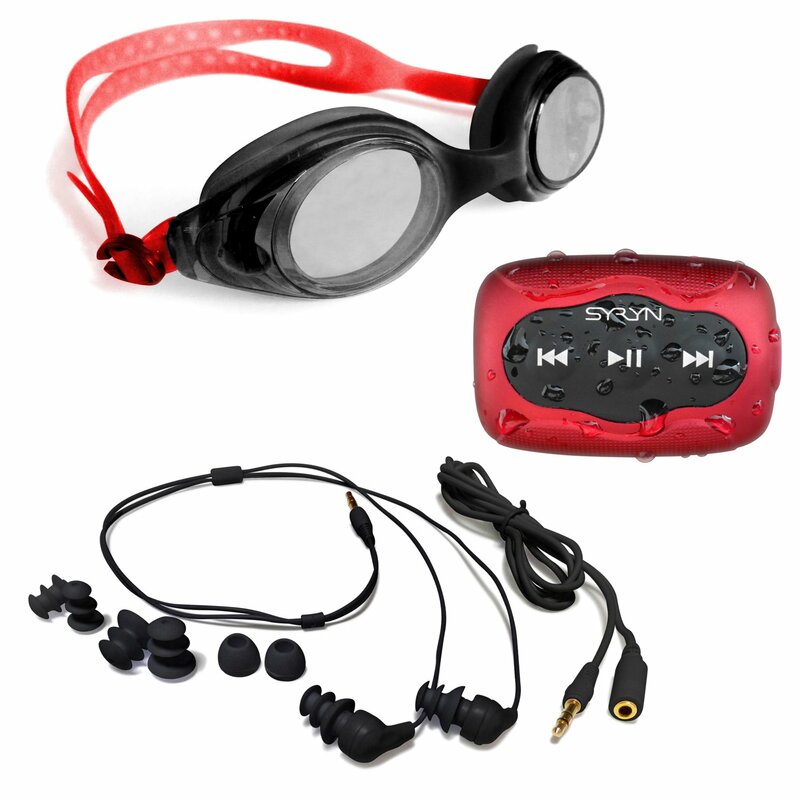 This underwater MP3 player has a small clip on the back very handy to attach it to any garment or swimming goggles. With the headphones, also waterproof, it is guaranteed that the equipment will work underwater without any risk of damage. Like all Apple devices, you need to connect to the iTunes application on your PC or Mac to add, sort or delete songs. The sound quality of the Apple equipment is indisputable and one of the keys by which the brand of the apple has become so popular all over the planet. It is a device of great quality like the other Apple computers. Therefore, who is a fan of the brand will be satisfied with the features you already know and additionally can dive without worries with your iPod in the water. 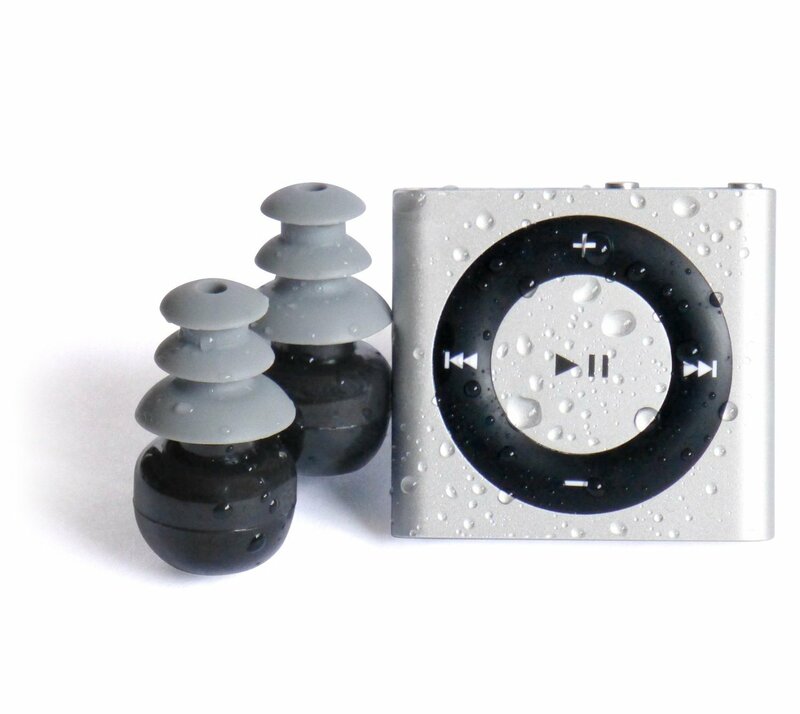 The waterproof MP3 player iPod Shuffle is compatible and plays multiple music formats: AAC (8 to 320 Kbps), MP3 (8 to 320 Kbps), MP3 VBR, Audible, Apple Lossless. Therefore, it allows you to listen to songs without loss of sound quality, AIFF, and WAV. One drawback is that it does not have Bluetooth. Therefore, it depends only on your own storage. Neither has a built-in radio. Sound quality, artificial intelligence with multiple functions, simultaneous translation to 40 languages, integrated MP3, Bluetooth connection, physical variables meter. Easy to lose due to its small size. 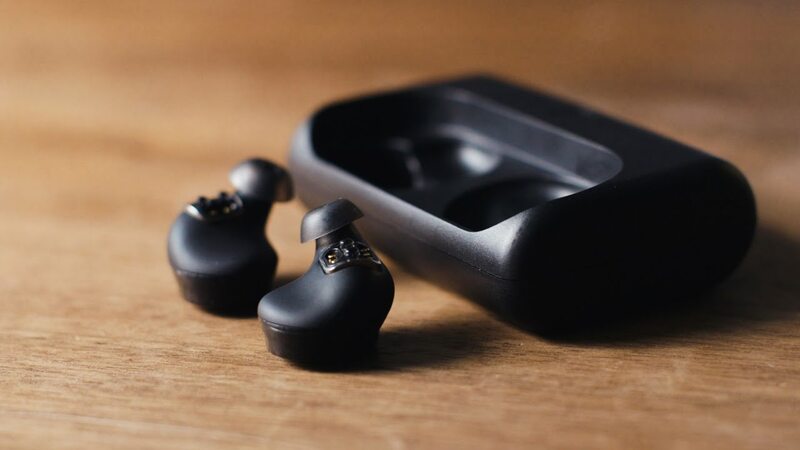 After some errors, especially of the Bluetooth connection, reported in the previous model, the German company Bragi has released the model The Dash PRO which in theory have solved all these errors and refined the operation of this gem of modern technology. This device is the closest thing to having a smartphone inserted into the ear canal. 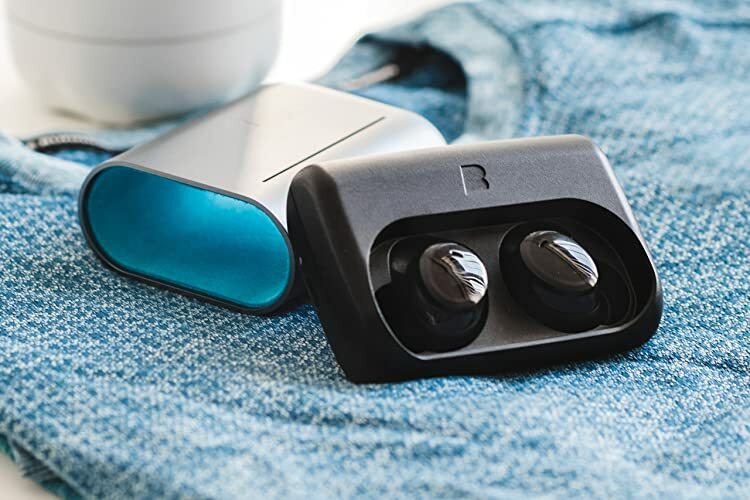 The Bragi Dash PRO is a Bluetooth wireless waterproof headset provided with Artificial Intelligence and a 4GB internal memory that could hold around 1000 songs in high quality. These earbuds and intelligent underwater MP3 have a wide range of applications in daily life. Its power lies in the BOS Artificial Intelligence software that can be updated as we do with our smartphones and their large number of sensors: 27 in total. The hardware is also impressive: it has 150 microcomponents. After analyzing them we have it clear: they are one of the best submersible earphones and mp3 player for swimming that exist in the market. The difference with the previous model is that they have solved some Bluetooth errors that dragged its predecessor, the Bragi the Dash. So in theory now the connectivity must go quite fine. They are completely wireless and with a pretty good range. They were designed to hold the body of each earphone with three points that form a triangle of support in the inner contour of the ear. The firmness of the grip is complemented by the soft silicone tips of the In-Ear type that are inserted in the ear canal and come in three sizes: Large, Medium and Small for a better fit. Bragi smart headphones are waterproof certified under the IPX7 standard, being able to immerse them up to 1 meter deep for a maximum of 30 minutes. In this case, the Bragi the Dash has a remarkable water resistance. Each headset has tactile controls that perform control functions of the music being played or activation of tracking of physical activities. As if that were not enough, it is also capable of detecting the movements of the head and other gestures that allow it to be controlled. The Dash are ultralight, each weighing about 8 grams. They are very comfortable and unlike others, they can stay in the ear for a long time. The sensors of these allow us to measure: the cardiac frequency, calories burned, duration of the routines, the steps, distance traveled, the rate, the speed, the temperature, and oxygen content in blood. Also when activating the sports tracking mode it is able to offer indications and motivate you to reach beyond your limits. The Bragi Dash have good sound quality, with compression algorithms that correct the bandwidth weakness of Bluetooth links to make them more efficient. These earphones passively isolate the sound that comes from the outside, thus improving the quality of the sound. This is achieved by the soft rubber tips adaptable to the ear. However, if you are looking for an excellent sound quality, we are afraid that it is not a suitable product for the most audiophiles. The only point against these water headphones is that the maximum volume is a bit low especially in noisy or outdoor environments. Through artificial intelligence, these wireless headphones provide indications, that is, interact with the user. The speakers by means of their voice synthesizer and with light signals LEDs that turn on and off in each of the earphones. The Dash is compatible with iTranslate, making it a simultaneous translator for more than 40 languages. Of course, this translation capability is only compatible for Bragi the Dash updated to OS 3.0 version. One of the several clever moves by the creators of Bragi’s The Dash was to equip them with a 2200 mAh external portable battery case to charge them up to 5 times at full charge. This yields approximately 30 hours of continuous music without recharging again. These underwater earphones last up to 6 hours with a full charge and medium volume. Of course, if we activate the sensors the battery life decreases to about 4 hours. These underwater headphones additionally are one of the best intelligent devices that exist in the market today and are in constant evolution. The new model has solved the small problems of Bluetooth that dragged its first version. We believe that it is a very powerful product motivated by its special features and multiple functions. Excellent sound quality, good support, compatible with multiple audio formats, no cassette or headphones required. No Bluetooth connection, cant measure physical variables. It is true that these submersible Sony MP3s may be a big tad. They weigh about 32 grams and are beautiful aesthetically. Despite its size, we were surprised by its comfort. The buds fit well in the ear and isolate the water quite well so that it does not penetrate the ear canal. Despite their size, they have a stylized design, typical Sony shapes. We believe that Sony has taken advantage of its size to showcase its brand. They are waterproof to a depth of 2 meters, which can even jump to the pool or practice surfing without a problem. 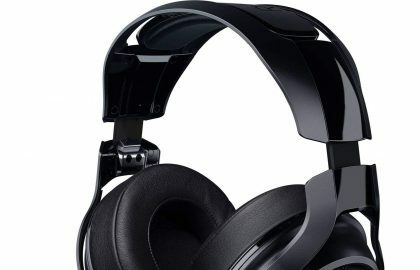 The controls are in the lower part of each headset, with the basic functions of forwarding, rewinding, playing and pausing, among others. They have a capacity of 4GB and 8GB, this amounts to around 1000 songs of high quality or 2000 with lower sound quality. 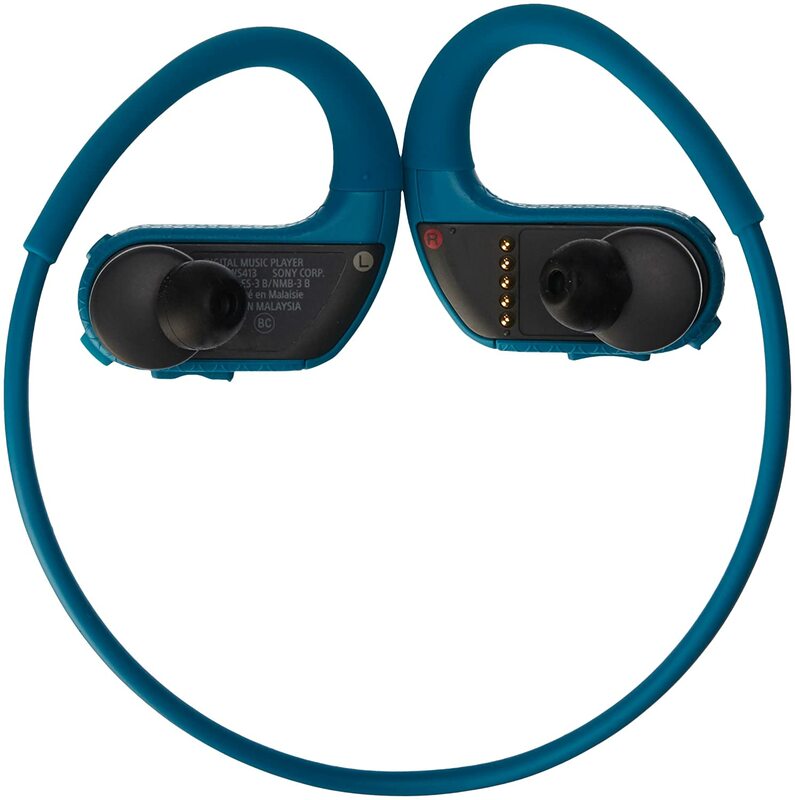 These Sony underwater headphones come in several colors that are present in all their extension with the Walkman and Sony logos on each handset. Sony headphones and MP3 water are also compatible with the most popular music formats such as MP3, WMA (Non-DRM), AAC, Linear PCM. Sony never disappoints us in terms of sound quality. This underwater MP3 player follows the Japanese tradition and presents deep bass and dynamic highs that do not lose clarity even if we raise the volume. As for the battery, it can last up to 8 hours of continuous music. The approximate charging time is 1.5 hours. It can be quickly charged for 1 hour of music in around 3 minutes. Innovative good quality, comfortable fit to the elastic band of the glasses, good battery life. It can only be used for swimming. The Finis Duo is ideal for those who do not want to have the earphones directly in the ear canal. The design of this MP3 for swimming is exclusive, and its specialization for this sport is the main reason that its support system is the elastic band of swimming goggles. They carry a cable that holds the duo and communicates to the device on both sides. Its sound transmission system makes it have excellent audio quality under water, with powerful volume. However, out of the water, the sound loses some power. It is compatible with the most used MP3 and WMA audio formats, audiobooks and podcasts can also be played, among others. In terms of data storage capacity, it has a memory of 4GB, with the capacity to put about 1000 songs of high quality. In terms of usability, it has 4 buttons on the right side to control the backward, forward, play and pause functions. The most popular color is black with sporty apple green, we have seen that it does not have much variety of colors, the other color is dark gray with green. 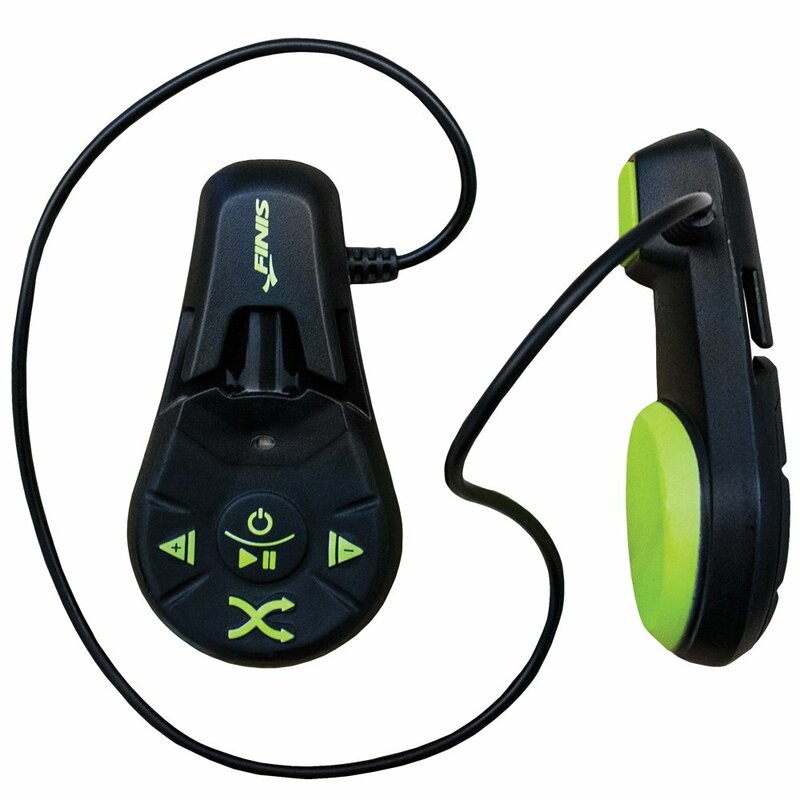 This has a waterproof certificate with IPX8 standard means that it supports up to 3 meters of immersion for 30 minutes. The sound is very good. However, you should bear in mind that being a bone conduction headphone, when swimming water may enter your ear. Although it seems strange, this can affect the quality of the sound and produce a strange sensation. For this reason, we recommend using earplugs made of wax or silicone. You will notice a great improvement in audio quality, much cleaner and precise. The lithium-ion battery gives the device the ability to play 7 hours of audio. The charger comes equipped with magnets to hold the device while charging. Good sound quality, 8 Gb of storage, comfortable, comes with thousands of training routines in different disciplines. They require an additional cover to submerge them, they are big, they do not have a Bluetooth connection. These headphones and MP3 player are out-of-ear design, i.e they are external and do not have tips inside the ear canal. They are designed to do sports in general like running, playing tennis or riding a bicycle. The advantage is that volume levels are maintained both outside and inside the water. They have no Bluetooth connection with our phones, they are independent MP3 players. By themselves, they are not submersible, and you need a silicone sleeve that will keep them watertight. The FX-Sport VR1 wireless headphones and MP3 are focused on the sports segment. 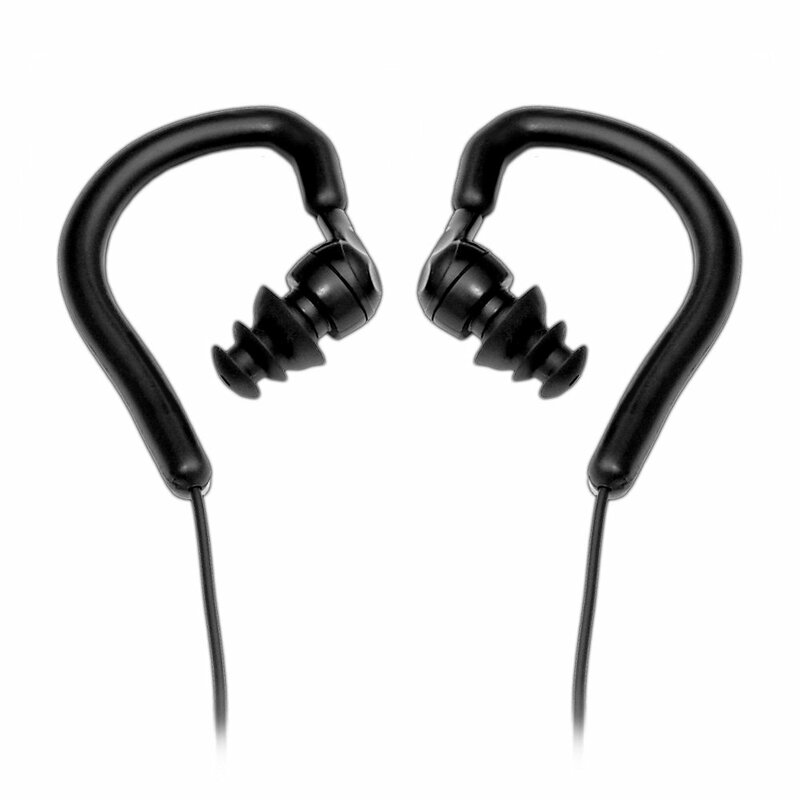 With them, you can listen to music and train according to the workout routines that you carry. It comes from the factory with thousands of specialized routines, such as: 10K, crunches, from the sofa to 5K, Crossfit, hit running, soccer, treadmill, weights, triathlon, swimming, personal trainers and more. But in case you fall short, you can load more routines through computer software. There are several categories and levels of difficulty. Through the application, you can also customize the workouts you want to execute. The recorded voices belong to real sports coaches and are mixed with our music so that there are no interruptions in the songs we hear. Through the application, you can also customize the workouts you want to execute. Important: to use it as an underwater Mp3, you must purchase the silicone sleeve that keeps them isolated from the water and allows them to be submerged. Without the cover, they are only resistant to the splashes and sweat but they cannot be submerged. Additionally, it comes in several metallic-looking colors, although they are mostly made of plastic. This headset and Mp3 player is relatively comfortable especially for those who do not want to have a device in the ear canal. They are held by a flexible band that goes over the ear and passes behind the head. They have an internal memory of 8GB to house the training audios and fill them with music. The FX-Sport VR1 have good sound quality. In addition, bass and treble can be adjusted, and as we have said, voices for routines are heard clearly. The volume level is more than decent, sometimes even too high, which is especially appreciated for those songs that sound less than they should. An important fact is its high storage capacity. The FX-Sport VR1’s battery lasts for 5 continuous hours of music. The device fully charges in 1 hour 45 minutes. The FX-Sport VR1 headphones warn you with an audible signal that you are running out of power. 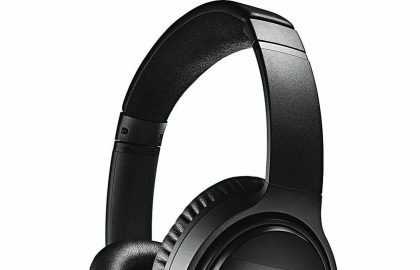 They look something big and actually unattractive compared to other headphones in their category, although this is because they are of the type above the ear. As they are made of plastic, for the most part, they are not so heavy. Excellent sound quality, good isolation, comfortable fit, extra short cable and extra long extension. 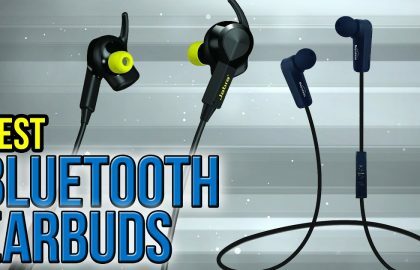 The Swimbuds Shortcord are underwater earphones that give good results. These submersible headphones are wired 3.5mm jack. They also come with several sets of interchangeable tips for underwater use. Under the water, tips of three circular cones have used that decrease in size to create a seal in the ear canal. Thus prevents the passage of water into the interior of our ear. In case you want to use on the surface you can place other tips that do not completely seal the ear canal. The Shortcord Swimbuds are perfect with the iPod Shuffle. They bring an extra short cable (0.25 m) that allows you to connect them to iPod and tie them behind your head attached to the elastic band of the swimming goggles. If you need more length, it comes with an additional extension cable that has a 3.5mm female connector. It boasts an impedance of 16ohm + -10% with a sensitivity of 102 dB + -3dB. They have a weight of 12 grams concentrated especially in its connector. The quality is quite good, with clear and powerful bass and treble. By sealing the ear canal well it allows a good and constant sound in the water. Good option for those who already have an underwater MP3 player and need a submersible headphone to accompany it. 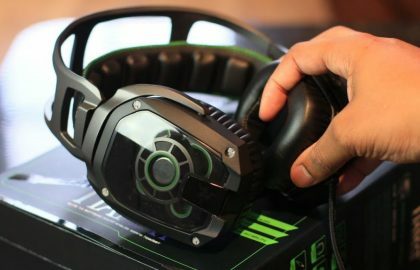 Good sound quality, comfortable fit, very cheap. They do not have external support, a little long cable. The H20 AudioFlex are cheap underwater headphones but of an acceptable quality. We have to say that they are waterproof and submersible up to 1 meter deep. H20 AudioFlex is of the in-ear type. They are inserted using a soft rubber tip in the shape of a rounded cone. A disadvantage is that they do not have additional support, they are fastened as a standard by the tips. This makes these water-resistant headphones susceptible to getting out of ears. They have a modern style highlighting their rounded shapes in the body of each headset, come in colors combined with black and gray. The appearance is bright plastic for heads and matte gray for the cable. Its cable is standard size, just over 1 meter. They have an acceptable sound quality with good presence in the low frequencies. Being in-ear headphones seal very well the ear canal so the sound is constant even when we are submerged in the pool. If you are looking for cheap submersible headphones with good value for money to accompany your waterproof MP3 player, this is an option. Good sound quality, very cheap. Similar to the one described above, these underwater headphones have a cable of a length of about 1.2 meters. They are also of the in-ear type that is inserted in the ear with flexible silicone tips. Their tips resemble swimming plugs with 3 thin cones that provide water insulation inside the ear. As usual, they come with 4 interchangeable tips to achieve the most comfortable fit possible. Unlike the previous one, they have an additional support that goes over the ear. On the other hand, they weigh about 68 grams, including of course the weight of the cable and 3.5mm connector. Some swimmers find the long cables uncomfortable, which could be a disadvantage, however, the sound quality is more than decent. 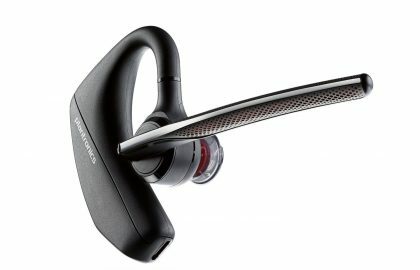 Finally, throughout this review, we observed that there are options adapted for all tastes, from the most sophisticated underwater MP3 players like the Bragi Dash, the bone conduction headphones like Finis Duo or the simplest devices and with a bit more technology analog as the FX-Sport VR1. Traditional brands like Sony and Apple have also adapted their products so that we can take them into the water the Sony NWZW413S and the Ipod Shuffle Waterproof, keeping our passion for those brands unaltered.